Your cholesterol health largely depends on your diet. Unhealthy cholesterol levels are important since they're a major risk factor for heart disease, the number one killer of men and women in America, according to the American Heart Association. While sardines and other seafood affect cholesterol counts, they also contain nutrients good for heart health. A fatty lipid necessary to human health, cholesterol is naturally made by your body. When you eat certain foods, dietary cholesterol is introduced into your system. When cholesterol levels elevate to unhealthy ranges, blood vessels can become clogged and hardened and blood flow negatively affected. Risk factors for high cholesterol include a poor diet, being overweight, lack of physical activity and family history. You can control your cholesterol levels by controlling your diet. Foods that contain cholesterol naturally will affect cholesterol counts. Animal products such as poultry, red meat, seafood and dairy products contain cholesterol. Processed foods that contain trans fats also raise cholesterol levels; examples include crackers, doughnuts and cookies. Saturated fat content raises levels of "bad" cholesterol -- called low-density lipoprotein, or LDL cholesterol -- more than anything else in your diet. Saturated fat is found mainly in animal products, including whole-milk products and poultry with the skin on. Because sardines are of animal origin, they contain some cholesterol. One 3-oz. 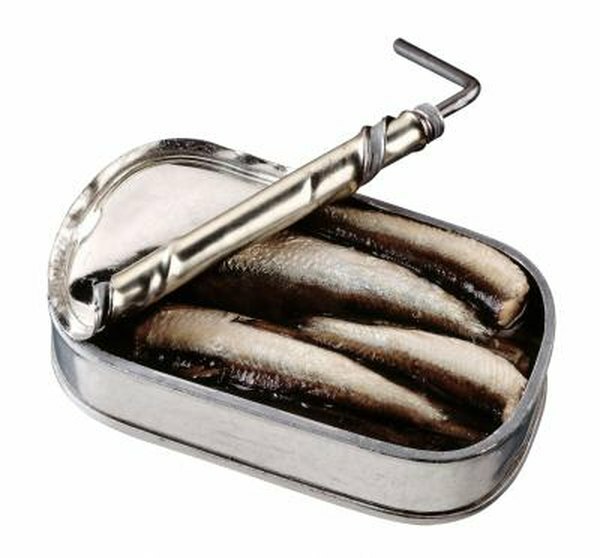 serving of sardines canned in oil contains 121 mg of cholesterol. By comparison, 3 oz. of canned shrimp has 214 mg of cholesterol. The saturated fat content of a 3-oz. serving of sardines is 1.30 g. Sardines have no trans fat. For a low cholesterol diet, the National Institutes of Health recommends reducing cholesterol intake to less than 200 mg per day and obtaining less than 7 percent of calories from saturated fat. For a 2,000-calorie-per-day diet, that means limiting saturated fat intake to 13 g or less per day. Aiming to lower unhealthy cholesterol counts will lower your risk for heart disease. Although sardines contain significant amounts of cholesterol and a fair amount of saturated fat, they generally contain less total and saturated fat than their protein counterparts of red meat and poultry. Consuming seafood, such as sardines, is actually recommended by the American Heart Association for heart health because it contains omega-3 fatty acids, such as EPA and DHA. Sardines contain fewer omega-3 fatty acids than salmon and tuna, but one 3-oz. serving of canned sardines provides 0.402 g of EPA and 0.432 g of DHA.